It's hard to find time - how long do I have to lie down for? Ideally, you need about 20 minutes every day for the procedure, as your body often takes this sort of time to become free enough for changes to take place - you really want to do a minimum of 10 minutes. This is particularly true when you are just learning how to use the procedure and developing your thinking skills. If you lie down more than once a day, subsequent sessions could be shorter. Some people find it helpful to use a timer or alarm, so that they don't have to worry about when to stop. Remember, this procedure offers you the quickest and easiest way to begin learning about the Alexander Technique and about your own body - you will get the most out of the money you pay for your lessons if you work on yourself regularly! Sometimes there will inevitably be occasions when we really do not have time to practise the lying down procedure. However, if you find this is a constant problem for you, you perhaps need to ask yourself, why are you are living in such a hectic and probably stressful manner? Is it really the case that you cannot give yourself a mere 20 minutes a day to look after yourself in this way? Perhaps it is more the case that you find you are resistant to doing the practise. This can happen for a variety of reasons: sometimes we can feel rebellious and do not want to let ourselves change; sometimes we can be afraid of thoughts and feelings that can surface when we let ourselves be quiet; or it can just seem uncomfortable to learn about ourselves. It may help you to talk to your teacher about some of these issues if you find they apply to you. Just do it on a regular basis and you'll find positive changes start happening in yourself. Can I lie down on my bed to practise? No. The reason for this is that unless you have an exceptionally hard bed, the mattress will give way and won't support your back, which will tend to become more curved, because the weight of your legs will push down into the bed as you lie in semi-supine. Your back, therefore, will be unable to lengthen and widen freely and your muscles may find it harder to release tension..
Also, there may be more of a temptation to drift off into sleep, rather than to work on yourself with an alert mind, with awareness. Of course, if you are experiencing a long period of illness, working on yourself whilst lying in bed can be extremely useful and can aid recovery. Remember, though, that the sooner you can lie on the floor as well as the bed, the more effective the work will be. To begin with, just keep reminding yourself to have a free neck, inhibit any urge to move around and just do less. Become aware of what is going on in your body, mind and feelings and see if you can learn about how they relate to each other. Over time, as you become more familiar with the procedure and the Technique, you want to give yourself directions and train your thinking to bring about changes in yourself whilst lying in semi-supine. See my article on the Lying Down Procedure for further information. My friend uses a different amount of books to me, why? 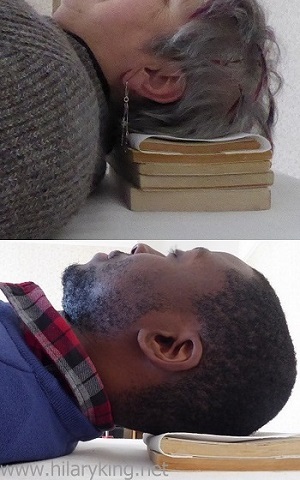 We each need the amount of books that will allow our necks to release and lengthen when the head is resting on them. This release needs to take place equally, through both the back and the front of the neck. If the books are too high, the chin will be pushed in towards the neck and possibly restrict the throat. If the head is thrust too far forwards, this can also put pressure on vertebrae at the base of the neck. Conversely, if the books are too low, the head will fall back and down onto the books, with the neck contracted and arched like a banana. In this position it will be less possible to let go of tension, free your muscles sand allow them to lengthen out again. The height of books used depends on each person's head-neck-back relationship, so the number of books used will vary depending on the shape of our bodies, so a child may not need any books, whilst some adullts may need several. Importantly, check the height of books that your teacher uses with you and make sure you have the same amount ready and waiting for you, where you practise the lying down procedure. The books hurt my head - what can I do about this? Firstly, make sure you use paperback books, they really are a bit softer than hardbacks. A cushion is too soft - it will give way, rather than your muscles letting go and giving way. Most importantly, when you move to lie down, say 'no' to arching your neck to put your head down. Instead, give yourself directions to free your neck and allow both your head and back to lengthen out and away from the top of the spine, as you place your head onto the books. Then keep giving yourself directions as you continue to lie in semi-supine and remember that the 'up' direction is related to the position of your spine, not the ceiling. Therefore you will need to think of your head flowing out towards the wall behind you (not pushing it). Continue to give yourself directions whilst lying still and say 'no' to tightening your neck and avoid arching it back and down. If we contract whilst lying down, this will increase the pressure onto the books and make the books seem even harder. When you undo that tightening and direct your head forward and up - or out and away from the top of your spine - you will probably begin to notice a reduction in the perceived hardness of the books. If you continue to have problems, try putting a mouse mat or towel on top of the books. This is firm but soft enough to take the edge off the hardness. However, do not substitute this for continuing to work on yourself and giving yourself directions. Before you try putting something softer under your elbows, check that you are not holding them tightly or holding your arms and shoulders in a way that pushes your elbows onto the floor. Keep doing less, free your arms and direct them out and away from your ribcage and spine. If the surface you are lying on is very hard, you could also try placing a mouse mat or small towel under each elbow. I'm travelling but books are heavy - what can I do? Weight is a problem for holiday makers, musicians and people who travel a lot for work. It will be a lot easier if you plan for this in advance and take some things with you to help. A thin, light, yoga or camping mat can be helpful to use for lying down, if you go to places with stone or wood floors. You may like to take something as a pad for your elbows as well, as these mats are usually narrow. For your head, cut up a gardening kneeling pad and always keep it with your musical instruments or briefcase. These pads are light, very cheap (approx 3), very portable and dense enough to support your head. If you are concerned about the environment, there are environmentally friendly versions made for yoga that you can buy. Keeping your head rest in with your equipment can also act as a visible reminder to lie down - particularly useful when life gets hectic! First of all, check the position of your feet on the floor. If you have placed them too far away from your body, they will tend to slip away and the weight of your legs will drag on your pelvis, possibly making your lower back arch. So, inhibit any urge to move without thought, then give yourself directions and bring one foot at a time closer in towards you. You want your feet to be more or less under your knees and in alignment with them. When your feet are placed in a better position, free your legs, directing them out and away and remind your feet not to grip the floor. If your feet still tend to slip away, perhaps your flooring is too smooth? Wearing slipper socks with non-slip feet can be a good idea, particularly in cold weather, as you do not want to get cold whilst lying down. You can also try using something that you may recognise from lying on an A/T table in lessons - a piece of mesh matting that is designed to go underneath carpets to stop them slipping. Put this under your feet, then enjoy freeing up your legs and feet. You can also try occasionally lying with your legs supported on a chair, so that they are more or less at right angles to your body. Can I listen to music whilst lying down? If you are just learning how to do the lying down procedure, it is best not to let yourself be distracted by something like music. You want to train your thinking and to work on yourself during the procedure so music or TV will take your mind away from your practise, maybe even encourage you to drift off into sleep. Then you will not develop the skills you are wishing to develop, nor have this incredibly useful tool under your belt, so that you can use it to help look after yourself. As you get more experienced at working on yourself, the aim is for you to be able to use your A/T skills, whatever you are doing. So listening to music sometimes should not be a distraction but you will be able to listen and work on yourself at the same time. However, you are more likely to work on yourself better, if you give yourself undivided attention during the lying down procedure. When is the best time of day to practise the lying down procedure? There is no one answer to this. The time that work's best for you and your lifestyle is best. To begin with, many people find it helps them to remember to practise, if they lie down at the same time each day and make it part of their routine. As you get more used to including the procedure into your life, you will probably find that the times you use will vary, according to your needs. First thing in the morning - allows you to start the day from a neutral place in yourself, set yourself up for the day and will encourage good use throughout your activities. Lunchtime - you can free yourself of tensions that have built up in the morning, restore your energy and prepare yourself for the afternoon. After work - allows you to let go of work and the tensions that built up during the day. It can also act as a period of transition between work and your private life, plus help you to approach the evening from a free place in yourself. 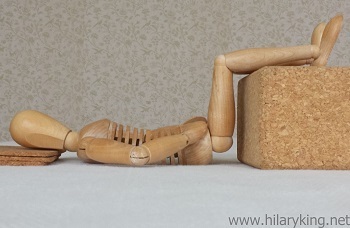 Before bed - this is a good time to practise the lying down procedure, if you tend not to sleep well. As you work on yourself, you will allow your body to go into sleep freely, without dragging so much 'stuff' into sleep with you. However, it is all too easy just to fall asleep on the floor, in which case you will not have done much work on yourself and will have to wake yourself up in order to get into bed - rather counter-productive. If this tends to happen to you then it's best to try the procedure at other times of day. The main thing is to actually practise the lying down procedure every day. Just do it! MORE QUERIES? Ask me at your next lesson. You are also welcome to email me or use the Contact Form to ask me any further questions you may have.